I know summer is almost over in a lot of people’s minds as you get ready to go back to school and all but before you throw out those old pool noodles (and before the temperatures dip) have I got a craft for you!! This is so easy (AND FUN!) you could do it with your eyes closed. Well, maybe not that easy (sharp objects and hot glue are involved) but seriously… you are going to do this craft and then start doing the math on how you could open your own etsy shop selling these things. • All you need are two pool noodles in different colors. I know, the stores aren’t selling them anymore but if you’re lucky like us you already have about eleventy million of them molding on your deck. First make sure your board (aka foam sheet) is square. They usually come in rectangles so you might have to shave off a couple inches with your serrated knife to make it the optimal ten by ten inch size. Next cut your craft foam sheets. One sheet you’ll cut 10×10 to cover your foam board. The other you’ll need to cut into four half-inch strips. These will be the tic tac toe stripes. When you have everything measured and cut, arrange it on your foam board. Then glue it down. Now you’re ready to make your game pieces with your foam noodles. Using your serrated knife cut 1-inch sections. You’ll need five of each color. 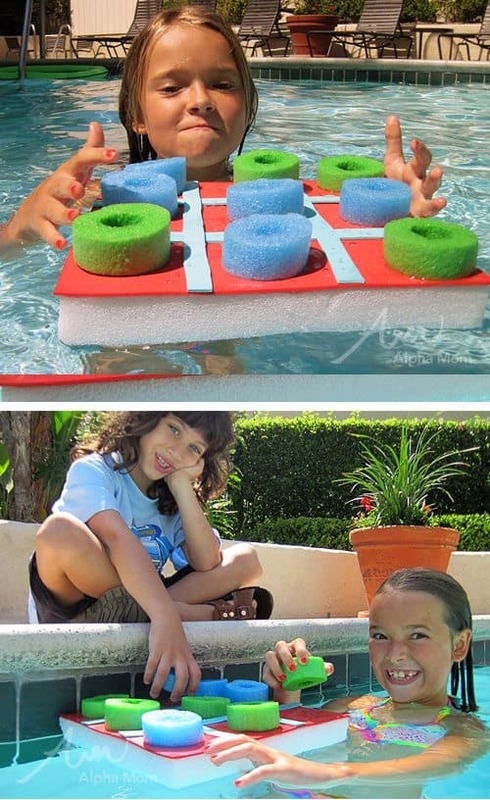 Just add water and you’re ready to play! 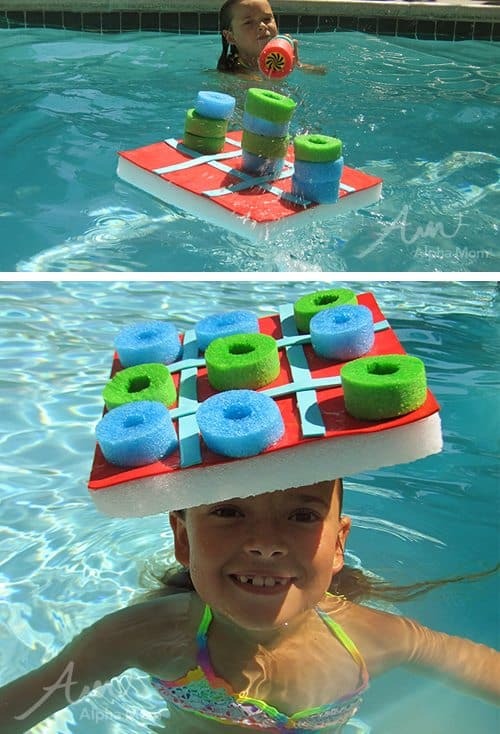 Of course you don’t need to play this in the water but it’s so so so much fun. You can make your game more difficult by playing in the deep end and making your opponent tread water. 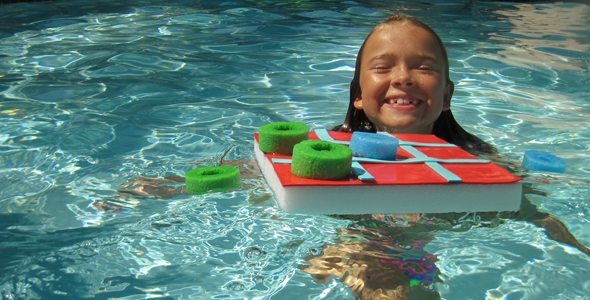 Or you can create other games like target practice with your water gun or balancing acts. The best part? 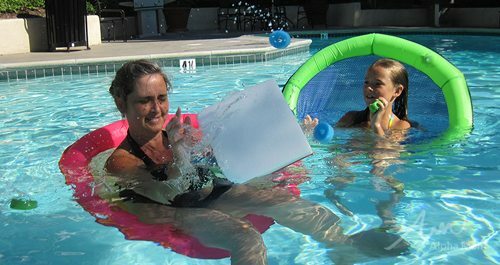 When you lose you can toss the whole game over with a big splash! * As usual, please use common sense and have a responsible adult on hand for any cutting or using of a hot glue gun.